This is a Chinese name; the family name is Lien. Lien Chan (Chinese: 連戰; pinyin: Lián Zhàn; Pe̍h-ōe-jī: Liân Chiàn; born August 27, 1936, in Xi'an, China) is a politician in Taiwan. He was Premier of the Republic of China from 1993 to 1997, Vice President of the Republic of China from 1996 to 2000, and was the Chairman of the Kuomintang (KMT) from 2000 to 2005, apart from various ministerial posts he had also held. Upon his retirement as KMT Chairman in August 2005, he was given the title Honorary Chairman of the Kuomintang. He is highly credited after holding a groundbreaking visit to Mainland China in his capacity as the Chairman of the Kuomintang to meet with the General Secretary of the Communist Party of China Hu Jintao on 29 April 2005, the first meeting between the two party leaders after the end of Chinese Civil War in 1949, which subsequently helped thaw the long-stalled cross-strait relations. Lien Chan was born in Xi'an, Shaanxi province, China as the only child of Lien Chen-tung [zh] and Chao Lan-k'un (趙蘭坤). His paternal grandfather, Lien Heng, was the writer of The General History of Taiwan (臺灣通史), a book that is often cited for the quote, "Taiwan's sorrow is that it has no history." Lien earned a Bachelor's degree in political science from the National Taiwan University in 1957 and a Master of Arts in International Law and Diplomacy in 1961. He received a PhD in political science in 1965 from the University of Chicago and married former Miss Republic of China Fang Yu the same year. Lien is also currently a Trustee Emeritus on the Board of Trustees to the University of Chicago. Lien held assistant professorships of political science at the University of Wisconsin–Madison from 1966 to 1967 and the University of Connecticut from 1967 to 1968. He returned to Taiwan in 1968 to become visiting professor of political science at the National Taiwan University, serving as chairman of the Political Science Department and dean of the Graduate Institute of Political Science the following year. His official positions included Ambassador to El Salvador (1975–1976), Minister of Communications and Transportation (1981–1987), Vice Premier (1987–1988), Foreign Minister (1988–1990) before becoming Governor of Taiwan Province (1990–1993). In 1993 he was appointed Premier of the Republic of China. In 1996, Lee Teng-hui selected him as running mate in the presidential election. Lee and Lien won the election for the presidency and the vice-presidency respectively. Before becoming Chairman of the KMT, he was Vice Chairman (1993–2000) and a member of the Central Committee (1984–2000). During his term in office, Lien was credited for having established National Health Insurance, which is the national health insurance policy for all citizens of the Republic of China. It ranks as one of the best national health plans in the world and modeled by other nations who seek to have a national health coverage for other citizens. He spearheaded the constructions of Cross-Island Highway (橫貫公路), a series of highways that connected the eastern side of the island to the western side of the island. Taiwan is dominated by the Central Mountain Range which cordons off the east from the west. In order to go to the eastern side from the western side, one had to circle the island to reach their destinations before the highways were constructed. After Lien constructed these highways, traffic back-and-forth between the east and west of the island was much more efficient. He also began the reconstruction to the Military dependents’ villages (眷村) which were temporary shelters designated for the military personnel and their families when the Kuomintang (KMT) first moved to Taiwan. There are over 879 of these Military dependents’ villages which housing nearly 100,000 households within. Most of this housing was temporary shelter and were constructed during the period between 1945 and 1950s to house the military personnel as the KMT retreated to Taiwan. Half a century later when it became clear that reunification with Mainland China under the terms of the Republic of China would not be possible, it became obvious that the housing for the military personnel would have to be reconstructed. Throughout Lien’s term as Foreign Minister and through his premiership, about 30 countries had diplomatic relations with Republic of China (Taiwan), this was the highest number of diplomatic relations since Republic of China was expelled from the United Nations in 1972 and severed diplomatic relations with the United States in 1976. Lien also established diplomatic relations with Commonwealth of the Bahamas, Grenada, Belize, Republic of Guinea-Bissau and reestablished diplomatic relations with Kingdom of Lesotho, Republic of Liberia and the Republic of Nicaragua. Lien also established the foundations for the Internet in Taiwan via research center established under the National Science Council (國家科學委員會). Further, he liberalize the telecommunications network which allowed for multiple players to compete and ushered in the mobile service era in the Telecommunications sector. He also revised and deregulated the regulation on cable television sector that allowing for multiple players in the television and cable sectors. These policies making Taiwan the most liberal area in Asia for Media. For the purpose of developing Taiwan as an economic hub in the Asia-Pacific, Lien espoused a platform called the “Asia-Pacific Regional Operations Center” because Taiwan has two natural deep water harbors, one is Keelung and second one is Kaohsiung, shipments from all over the world would transport and transfer in these harbors before heading to Japan, Korea, China or Southeast Asia. However, due to Lee Teng-hui’s (李登輝) “two state solution” (兩國論), a theory advocated for China and Taiwan to engage in a special "state to state relationship", Mainland China was deeply angered, therefore Taiwan became increasingly marginalized. Lien took an active role as a representative of Lee Teng-hui in quasi-official diplomacy in the mid-1990s. One of the greatest moments of his career is his 1995 meeting with Václav Havel, in which Lien likened the democratic reforms of the Lee Teng-hui administration as being similar to the Velvet Revolution. After the defeat of the KMT in 2000, Lien assume the leadership of the KMT. As the Chairman of the KMT, Lien vowed to learn from his loss and remake the KMT party. He held forums to discuss erasing the KMT's image as a corrupt institution and Lien promised to give up property seized by the KMT after the Japanese exodus. The Pan-Blue reunited in the election of 2004 with Lien and Soong running on a combined ticket against DPP’s Chen Shui-bian and Annette Lu. Chen Shui-bian was the incumbent and was trailing 13% behind in the polls before ballot day. Then, out of nowhere came two bullets, one barely grazing Chen’s belly and another one grazing Annette Lu’s knee. Immediately the DPP-control government suspended all election activities and prohibited all servicemen, policeman and security workers to return home to vote. The servicemen are typically Pan-Blue voters and number of service men affected was roughly 350,000. The DPP Secretary General of the President’s office Chiou I-jen (邱義仁) immediately came out on media to announce that there was an assassination attempt on the DPP candidates Chen and Lu and accused the KMT of collaborating with the Chinese Communists Party to assassinate Taiwan’s President. Lien lost that election by 0.228% margin, a mere 29,518 votes out of a total of 12,914,422 (12 million nine hundred and fourteen thousand four hundred and twenty two) ballots cast. Both Chen and Lu were released from the hospital on the same day and went to vote on the next day. Neither one had life-threatening injury nor did they lose consciousness or had a surgery. Rather, alleged assassin Chen Yi-hsiung (陳義雄) was killed and his body was found ten days later ditched into a pond near where he lives. His body was formally dressed in suite and tie and entangled in a fishnet. This incident sparked mass riots and controversy because it was believed that the shooting was staged in order to gain sympathy votes for Chen and Lu who won by a sliver of a margin. Hence the 319 Shooting Truth Investigation Special Committee was established. On 31 Jan 2008, the 319 Shooting Truth Investigation Special Committee concluded its investigation into the assassination attempt on President Chen Shui-bian (陳水扁) and Vice President Annette Lu (呂秀蓮), and raised questions about whether the shooting was a staged event. "We have compared all of the evidence and clues through interviews and reconstructed the scene. Although the truth of the event remains unclear, the "truth" that government publicized and the evidence don't match," committee convener Wang Ching-feng (王清峰) told reporters. The report also suggested that Chen Yi-hsiung (陳義雄), whom the authorities identified as the shooter, was murdered instead of committing suicide when he was found dead 10 days after the incident. In 2005, after Ma was elected as KMT chairman to succeed Lien, the KMT Central Committee offered the title of "Chairman Emeritus" (Honorary Chairman) to Lien. Lien Chan and the Kuomintang touring the Sun Yat-sen Mausoleum in Nanjing. 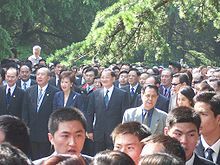 The Pan-Blue coalition visited the mainland in 2005. 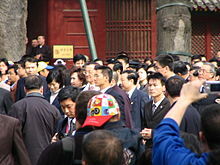 On April 26, 2005, Lien Chan traveled to mainland China to meet with the leaders of the Communist Party of China (CPC). His meeting with Communist Party general secretary Hu Jintao was the highest level exchange since Chiang Kai-shek and Mao Zedong met in Chongqing on August 28, 1945, to celebrate the victory in the Second Sino-Japanese War and discuss a possible truce in the impending Chinese Civil War. On April 27, Lien visited the Sun Yat-sen Mausoleum in Nanjing. On April 28, he arrived in Beijing. On the afternoon of April 29, he met with PRC Paramount leader Hu Jintao (in his capacity as General Secretary of the Communist Party of China). Before meeting with Hu on April 29, Lien Chan delivered a speech at Peking University, which his 96-year-old mother Chao Lan-k'un attended nearly 80 years ago. On April 30, he headed to his birthplace Xi'an. He revisited Houzaimen Primary School, which he attended 60 years ago. He also visited the Great Mausoleum of Qin Shi Huang, China's first emperor. Early on May 1, he paid homage to his grandmother's tomb near Qingliangsi. Later that day, Lien arrived in Shanghai, where he attended a banquet hosted by Shanghai CPC Party Secretary General Chen Liangyu. On May 2, he met with Wang Daohan, the 90-year-old chairman of the mainland-based Association for Relations Across the Taiwan Straits, and the representatives of Taiwanese businesspeople. He returned to Taiwan at noon on May 3. In October 2005, Lien made his second visit to the mainland. He visited Shenyang, Liaoning to pay homage to his maternal grandmother's tomb at Lansheng Village and the school where his mother studied. In April 2006, Lien departed to Mainland China to visit Fujian. He paid tribute to his ancestors in Zhangzhou and received an honorary doctor's degree from Xiamen University in Xiamen. On 11 April 2006, Lien arrived in Hangzhou, Zhejiang. He was welcomed by Xia Baolong, deputy secretary of Zhejiang Provincial Committee of the Communist Party of China at the Hangzhou Xiaoshan International Airport. In Hangzhou, Lien met with provincial government leaders and visited the West Lake. Two days later, Lien visited Beijing to attend the first Cross-Straits Economic Trade and Culture Forum. Lien met with CPC Secretary-General Hu Jintao at the forum, where both underscored the peaceful development of relations between the two sides. In April 2010, Lien visited Shanghai to attend the opening ceremony of the Shanghai World Expo 2010. In February 2013, Lien visited Beijing to meet with Xi Jinping, the newly elected General Secretary of the Communist Party of China. Lien also met with Yu Zhengsheng (chairman-designate of the Chinese People's Political Consultative Conference), Wang Huning (member of the Politburo of the CPC), Li Zhanshu (chief of the General Office of the CPC), Dai Bingguo (state councilor of the PRC), Wang Yi (director of the Taiwan Affairs Office of the State Council), Chen Yunlin and Zheng Lizhong (president and vice president of ARATS). Lien and his wife Lien Fang Yu also visited Beijing Aerospace Command and Control Center and met with Liu Wang, Liu Yang and Jing Haipeng, astronauts of the Shenzhou 9. Lien and delegates from 80 business leaders and civil group representatives, including former Taiwan Solidarity Union Chairman Shu Chin-chiang, visited Beijing on 17 February to meet with Zhang Zhijun, the head of Taiwan Affairs Office, and on 18 February with Xi Jinping, General Secretary of the Communist Party of China Central Committee, at the Diaoyutai State Guesthouse for non-governmental exchanges. This 3-day trip came after the invitation from the Communist Party of China. Lien was invited to a Chinese military parade marking the end of the Second Sino–Japanese War in September 2015. During the visit, Lien asked Beijing to strongly consider supporting ROC President Ma Ying-jeou's East China Sea Peace Initiative. Lien Chan at the 2008 APEC Summit in Peru with Dmitry Medvedev. Lien was selected by President Ma Ying-jeou as special envoy to represent the Republic of China (participating as Chinese Taipei) at the Asia-Pacific Economic Cooperation (APEC) in 2008-2012. While at APEC, Lien also met with PRC leader Hu Jintao, the highest level of official exchange between the Mainland and Taiwan on the international stage at that time. Lien Chan was descended from a family of literati. His family arrived in Taiwan during the Emperor Kang Xi era and had settled in Tainan residing in an area called Ma Bing Ying; which was the former training ground of the Zheng Cheng Gung forces in his campaign against the Dutch. Lien‘s family harvested sugar on their plantations for generations. And Lien’s grandmother’s family were also wealthy merchants who traded camphor and sugar. Lien ‘s mother, Chao Lan Kun came from wealthy family in Shenyang and is credited for having preserve the family wealth throughout the turbulent times of post Japanese colonization. Lien is married to Lien Fang Yu. They have two sons, Sean Lien and Lien Sheng-Wu (連勝武), and two daughters, Lien Hui-Hsin (連惠心) and Lien Yong-Hsin (連詠心). Wikimedia Commons has media related to Lien Chan. ^ "Lien Chan embarks on China visit - Taipei Times". ^ Eyton, Laurence (14 March 2000). "Would-be heir to whose legacy?". Taipei Times. Retrieved 8 February 2017. ^ 歷任首長 [Past Chiefs]. tpg.gov.tw (in Chinese). Taiwan Provincial Gov't. Retrieved February 22, 2017. ^ "Lien office denies hearing of award". Taipei Times. December 26, 2012. ^ "People's Daily Online - Lien Chan arrives in E. China province". English.people.com.cn. 2006-04-21. Retrieved 2014-05-28. ^ "People's Daily Online - China's top political advisor meets Lien Chan ahead of mainland-Taiwan forum". English.people.com.cn. 2007-04-27. Retrieved 2014-05-28. ^ "Kuomintang Honorary Chairman Lien Chan arrives in Shanghai for World Expo". News.xinhuanet.com. 2010-04-29. Archived from the original on 2010-05-03. Retrieved 2014-05-28. ^ "China head pledges continued peaceful cross-strait relations". The China Post. 2013-02-26. Retrieved 2014-05-28. ^ "Lien Chan hails mainland aerospace achievements |Politics". chinadaily.com.cn. 2013-02-27. Retrieved 2014-05-28. ^ "Lien has no specific mission on upcoming visit to China: spokesman | Cross-Strait Affairs | FOCUS TAIWAN - CNA ENGLISH NEWS". Focustaiwan.tw. 2014-02-14. Retrieved 2014-05-28. ^ "Lien Chan set to meet Xi during 3-day trip to China". The China Post. 2014-02-15. Retrieved 2014-05-28. ^ "TSU expels former chairman, revokes party membership". Taipei Times. 2014-05-22. Retrieved 2014-05-28. ^ "Lien Chan's daughter in court over 'insult' claim - Taipei Times".